Ayanna Pressley Is Mapping A New Direction For The Democratic Party. Its Presidential Candidates Want Her Support. Rep. Ayanna Pressley listens as Michael Cohen testifies before the House Oversight Committee on Capitol Hill on Feb. 27. Ayanna Pressley was one of the most surprising congressional candidates of 2018, upsetting a longtime Democratic incumbent in one of last year’s most closely watched primaries. Now, as she cultivates a national profile that reflects the political yearnings of a movement of black women in the Democratic Party, candidates are engaging in a high-stakes fight for her backing in the 2020 Democratic presidential primary. Pressley may not be as famous as House colleagues like Alexandria Ocasio-Cortez, who is busy wresting power from more senior lawmakers through a combination social media virality and headline-grabbing proposals. But the backing of the first black American woman to be elected both to Boston’s City Council and to Congress in her state’s history is certain to get the attention of the black women set to have an enormous impact on 2020’s nomination process. “Ayanna has done something in Massachusetts twice that no one who looks like her has done before, so when she says or does something as important as endorsing a presidential candidate it will get our attention as black women,” said A’Shanti F. Gholar, the national political director for Emerge America, which trains and encourages Democratic women to run for elected office. “We have to deal with a lot stress as black women. Whether it be in our daily lives’ work or dealing with people in our community. So when you see another black woman who is able to achieve what she has, we know that she had to fight, she couldn’t be scared or back down against people who told her that that office was not for her. That alone is going to get people’s attention and make them want to be in the room with her. Symone D. Sanders, who had a top role in Bernie Sanders’ 2016 presidential campaign, told BuzzFeed News that she’s convinced the Democrat in the presidential race who most effectively excites and mobilizes black women is going to be the party’s nominee. Sen. Elizabeth Warren and Pressley talk at a rally also attended by Democratic gubernatorial candidate Jay Gonzalez on Sept. 9, 2018, in Cambridge, Massachusetts. Booker, known for being a regular at meetings of the Congressional Black Caucus, has been in contact with Pressley, according to someone familiar with the communication. Pressley and Booker had a “great” constructive conversation during the annual legislative conference of the Congressional Black Caucus Foundation, the source said. Both are interested in legalizing marijuana in a way that promotes justice for black people and creates pathways for greater inclusion for black entrepreneurs. While Booker and Harris have rolled out endorsements from home-state politicians, Warren has so far not released a similar show of support from Massachusetts Democrats, like Pressley. 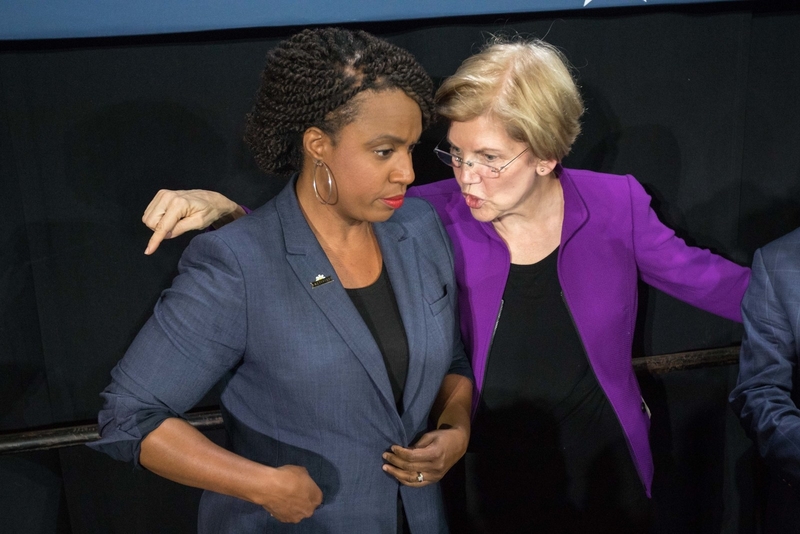 Pressley and Warren have a relationship that goes back years: She was one of the first significant state Democrats to back Warren’s 2012 Senate campaign to unseat Scott Brown. Once Warren was the nominee, Pressley served as a surrogate. According to two sources with knowledge of matter, Warren faced internal pressure from inside the party to endorse incumbent Mike Capuano over Pressley in last year’s House primary, but cited her close relationship to both of them as the reason she elected to stay out of the race. After Pressley won, she and Warren traveled to Georgia to campaign for Stacey Abrams. Almost as soon as she became a serious threat to Capuano in last year’s primary, Pressley felt the force of resistance to her candidacy in the Democratic Party: EMILY’s List, which wants to elect pro-choice women to office, had named her its 2015 recipient of the Gabrielle Giffords Rising Star Award, but declined to endorse her in the primary; the political arm of the Congressional Black Caucus endorsed her opponent, as did former Massachusetts governor Deval Patrick, citing how Capuano had taken a chance on him when he was unknown. For Pressley, though, thinking through 2020 is about more than her endorsement or who the nominee is. The two aides familiar with Pressley’s thinking said she’s strategizing about ways to push her party in a new direction, away from the conventions that defined who is electable, and cast Capuano as a sexagenarian avatar of the Democrats’ political malaise. Pressley’s commitment to move her party to adopt new rules and ways of doing things reflect the politics of #BlackWomenLead, a black-led movement within the party. The movement, while critiquing Trump’s moral leadership, wants to emphasize what Democrats are pushing for and reorient the party’s voter outreach efforts more fully around people of color. It wants the party to reward black women’s partisan loyalty with power, and institutionalize plans that would create more Ayanna Pressleys, especially given how much more difficult it is for black women candidates to raise money. The movement also wants to frame black women’s work for the Democratic Party as a morally principled, intergenerational force of resistance that helped build and preserve American democracy, rather than just blind loyalty for Democrats to take for granted. That was the substance of Pressley’s address to a closed-door meeting of top Democratic Party donors in Washington late last year, which was first reported by BuzzFeed News. Pressley has expressed both in private and in public that there are lessons from her race she believes are necessary to adopt in order for the party to win in 2020. Pressley said in the meeting that Democrats have to be honest about their shortcomings — and grapple with both the question of whether the lives of black Americans matter only in election years, and why, as an institution, the party has failed to support insurgent candidates like her. Since getting to Washington, Pressley has modeled a legislative style that recalls Shirley Chisholm’s populism and courage as the first black woman ever elected to Congress. (Pressley scored the congressional office that had once belonged to Chisholm; knowing that she was her idol, Katie Hill of California, after being given the office, wanted her to have it.) Along with Eleanor Holmes Norton, Pressley sponsored legislation ensuring protections for low-wage federal contract workers who were not guaranteed back pay after last month’s government shutdown. Her first floor speech was a sharp, one-minute rebuke of “the occupant of the White House” that has been viewed well over a million times. According to a top aide, Pressley is watching how the 2020 candidates deal with her fight against the Department of Homeland Security’s immigration enforcement policies. Disturbed by the separation of children from their families at the border, Pressley led a group of lawmakers that included Ocasio-Cortez and Rashida Tlaib in a letter to colleagues calling for stronger oversight of Immigration and Customs Enforcement (ICE) and Customs and Border Protection (CBP). The group of lawmakers is calling for cuts in funding to both agencies, and an end to mechanisms that enable the Trump administration to ramp up detention programs. Pressley, who sits on the Oversight and Government Reform Committee, was one of 19 House Democrats to vote no on a government funding compromise, citing an increase in funding for DHS. Most of her posts on social media show her actually working, or are crafted to let her constituency in on the insidery, day-to-day details of what it’s like to be a member of Congress. She calls her legislative apparatus, in Boston and in Washington, an “organization,” and is trying to build a pipeline of leaders who will find their footing as a members of the organization. Even though she’s only been in office for a little over a month, Democrats are excited about what she could mean for the future of their party. Pressley’s shown that she can inspire outside of traditional politics — a picture she posted of herself on Twitter in glasses after she ran out of contacts went viral, with women responding with pictures of themselves in glasses. The picture and the replies became a Twitter Moment.